It is important to understand the concept of human movement and be able to identify the muscle doing the work in an exercise and the type of contraction occurring. It is even more difficult to apply these concepts to different environments. Pure movement is different than movement on land affected by gravity. Movement in the water is different because of the presence of gravity and buoyancy as well as the drag forces of the water. Adding equipment complicates the muscle and contraction equation even more! The purpose of this course is to help you sort through muscles and contractions in various fitness environments to improve your understanding and increase the effectiveness of your instruction. This course is also part three of a three course certificate program. Part one is Introduction to Aquatic Personal Training and part two is Aquatic Personal Training Programming. Explain and demonstrate movement in the planes and axes of motion. Understand anatomical movement terms. 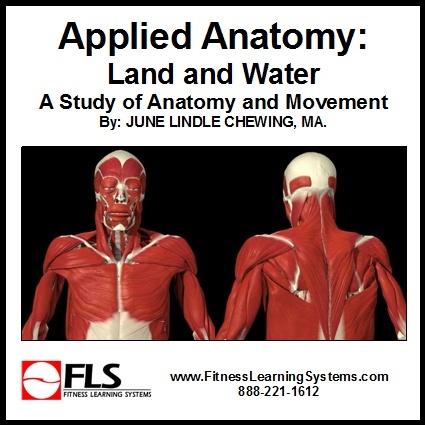 Identify and describe movement at the major joints in the body.